I recently stumbled over an online community dedicated to the Microbee, an Australian computer made in the 1980s, called the Microbee Software Preservation Project. This made me very excited. My Dad owned a Microbee when I was little, so it’s one of the first computers I remember (though by the time we could play games he also had a 286 PC which saw more gaming use). We had a version with a hard drive, but some of the more basic versions would run solely off floppy drives or cassette tapes. Our Microbee didn’t survive one of my family’s relocations (I think it had stopped booting), which is a great shame because it was a pretty fun little thing, in its way. I remember a couple of games. There was a brick, ball and paddle game, which was fairly challenging because the computer would only respond to your key presses pretty slowly. The game I spent most time on was called Jeskil’s Revenge, a text adventure written in MicroWorld Basic by John Maling in 1985 (according to the source code). I played this a lot after I claimed the Microbee as my own in my early teenage years, and I always got stuck. I even printed out a copy of the source code to try to find my way through like a 1337 h4x0r, though from memory it didn’t help. 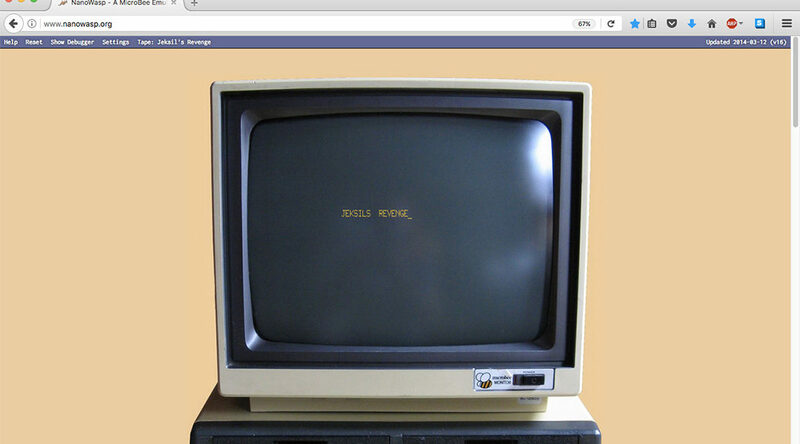 There are several Microbee emulators developed now, one of which is online: NanoWasp. This has Jeskil’s Revenge as one of the ‘tapes’ you can load and play. So I played it for the first time in about 20 years. Having recently played Colossal Cave Adventure (sometimes just called Adventure or ADVENT) on one of my Raspberry Pis, it was interesting to compare the two. Jeskil’s Revenge tells you which commands you can use up front. The world feels smaller (though I seem to remember getting lost in it well enough), though a little more descriptive; Adventure has some moments where the descriptions shine, but many of its descriptions seemed more functional. Or perhaps I’m just less skilled at imagining underground spaces than windswept cliffs. Jeskil’s Revenge is also time-limited somehow (I’ve never hit the limit though). Oh, and it pretty much never gets the ‘your’/’you’re’ distinction right. Perhaps it’s an example of grammar being sacrificed to save memory? Not sure. Anyhow, I’ve played it through to the point where I’m pretty sure I’ll need to use pen and paper to map the maze (if it’s even a maze); I’ll have to do that when I have free time again. Also, I’d love to port the game to a modern platform to bring it to the masses, but that’s definitely a post-thesis project. Another fantastic thing is that the Microbee brand has been resurrected. The folks at Microbee Technology have got things going again and have produced some Microbee kit computers that are compatible with the old machines (though they’re sold out at the moment, and have been for a while if forum posts are any indication). Pretty excellent. I’ve been looking a bit lately at game preservation and thinking about preserving Australian video game music somehow; it’s interesting and potentially really useful that there’s an option that slots between using old hardware and using an emulator for the Microbee platform. I think I might get one of the kits someday, learn to solder, learn to code, and go to town.